Restaurant Savu is located on the Tervasaari island, on the eastern shore of Helsinki center. The red Tervasaari storehouse, built in 1805 for storing tar barrels, creates an unique milieu for Savu. In the old days households were counted based on the number of smoke (=Savu) plumes you could see rising from a village. 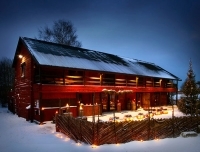 Restaurant Savu is the only "savu" on Island Tervasaari. At Savu we also use smoke-curing, which is one of the oldest methods of cooking. During hundreds of years tar has played a very important role in Finnish culture. Tar has been used to lengthen lifetime of different goods, like tar ropes, and it has also been used in folk medicine. Tar has also had an important role in preparing and flavouring food. At restaurant Savu tar flavour is used daily in cooking. We also use smoke-curing and our à la carte menu includes appetizers and main courses smoked with various methods or seasoned with smoke aromas. The menu will change seasonally. The dessert menu is short but tasty. Our classic dessert is pancakes prepared by our pancake chef. With pancakes you will get several delicious accompaniments, also pine tar! At Savu you also have an opportunity to taste tar flavoured beer and schnapps. Also a special tar ceremony can be reserved for groups in advance. In addition to a 90-seat dining room there is one private room in the storehouse loft. In the summer you can enjoy à la carte dishes also on the cosy and partly covered outdoor terrace by the sea. The historical storehouse provides a unique milieu also for meetings and private events. Restaurant Savu is located on Tervasaari Island, which is connected to the mainland by a causeway. You can reach Savu either by foot or by car. The restaurant doesn’t have own parking places. Nearest parking places are located on the causeway Tervasaarenkannas Street, and on streets Pohjoisranta and Siltavuorenranta. The busses (16, 17, 18N) drive to Kruununhaka and Liisanpuistikko, where the nearest bus stop is 400 meters from the restaurant. Further information and timetables at: https://www.hsl.fi.